You must have searched a lot for finding free VPN connections that work on your smartphone, be it iPhone or Android. But to your surprise there are not much of these services available. Although there are services available but they are either for a limited time or comes with advertisements. In this article you will get to know a free VPN service that you can use on your PC, plus how you can extend that service to be able to use the same connection on your smartphone or other network devices. With growing use of mobiles/tablets its necessary these days to connect them to some VPN in order to consume content that is not available due to geographic restrictions. There are not many solutions available today that allow use of free mobile VPN. The ones that are available have some or the other catch. The best ones are not free, those that are free requires you to either root your device, or they are available for a limited time, or limited bandwidth is available for use and other similar setbacks.So finally here is a solution that you can use to get a free VPN for your smartphone be it andorid or iPhone. Recently we found a decent free VPN service which allows users to connect to their network for free using PCs/Macs. Sadly, they are still not available for mobile devices. Keeping this in mind our quest began for extending the same VPN connection to your mobile devices. Finally we achieved what we needed and here is how you too can share your PCs VPN connection with your mobile devices. Using this method allows you to connect to a secure network and with best possible speeds without nagging advertisements. And all these comes for FREE! Please install following two software in order to make this work. 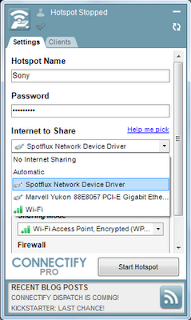 Spotflux - Spotflux is a great service and comes for free! Please go through our article Free VPN client for PC and Mac which talks about what this service provides and how to get it working! 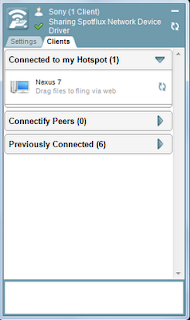 Connectify - Connectify is a solution for Windows that allow you to share your internet connection over Wifi. 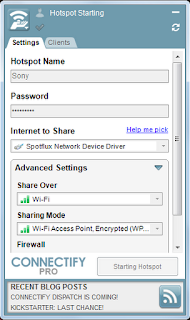 It works for both scenarios that are: share Wired (Ethernet) internet connection over WiFi OR Share WiFi Internet Connection over WiFi (with supported Wireless Network Card - Check here if your card is supported) If you are confused just install the program and try to use. 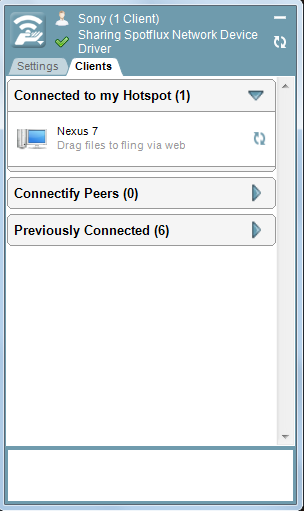 STEP 2: Run Connectify and go through the process of creating a hotspot if you have not already done so. Just wait and do not start your hotspot yet. 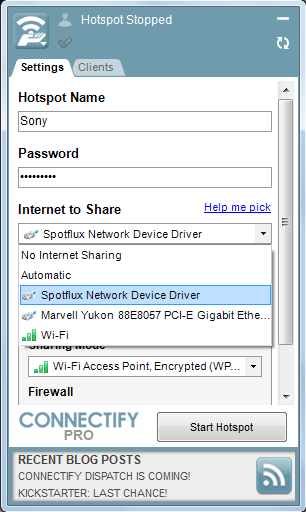 STEP 3: Now in Connectify, Under Internet to Share you will see 'Spotflux Network device driver'. 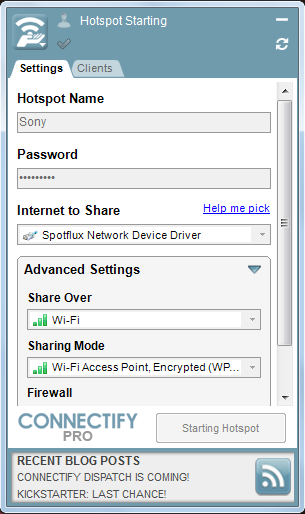 Just select that, and click Start Hotspot button. STEP 4: WiFi hotspot will start in a moment and then you will be able connect your mobile devices to it. Once connected on a mobile device visit www.whatismycountry.com to check for your country. It will show United States as your country! Now you're done! You have successfully established a free VPN connection and shared that with your mobile devices. OR by following us on Ttwitter! This will help you stay updated with all other cool things we write on our blog and encourage us to write more workarounds, tricks and tips!